In the third week of our video content marketing month, today's Video Worth Sharing features a video marketing funnel from a small brand doing big things with video: Saddleback Leather. Saddleback make high quality, long-lasting bags, briefcases, purses, wallets — whatever can be crafted beautifully from leather. Though fairly small, the company uses video content effectively to raise awareness and attract just the right kind of audience to their brand. Thanks to videos at all stages of the funnel, this initial traffic turns into leads, customers and evangelists for Saddleback. Scroll on to take a look at just how they do it. We hope you enjoy! Saddleback Leather are well-known for their sarcasm and quirky sense of humour. The business produces many of top of funnel videos that manage to be simultaneously educational and entertaining, ensuring leads remember the brand even if they don't convert straight away. When leads become more serious about buying, Saddleback Leather are sure to be upfront about their wares. Product videos like this are a key differentiatior on their product pages to allow visitors to see how the goods look, feel and wear before they take the plunge. A large part of Saddleback's brand is built on the quality of their products. At the bottom of the funnel they must prove that quality to potential customers. 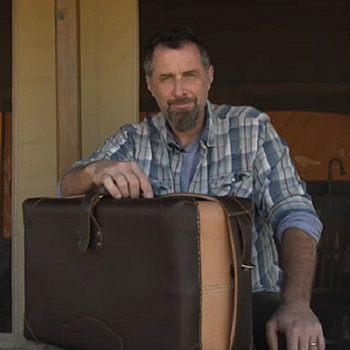 That's why they created a series of videos showing their bags surviving some aggressive real-world quality testing.